Brock CareerZone Blog: Career and Post-Graduate Expo 2012! 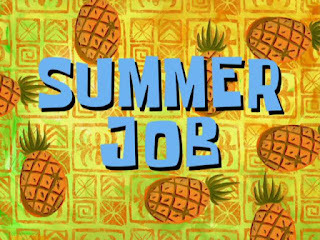 So you're graduating this year. You're considering entering your field in an entry-level position, or maybe you'd like to further your education with a post-graduate certificate or Master's Degree. But where to start? 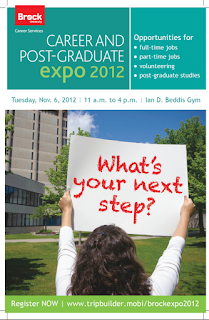 Well why not check out the Career and Post Graduate Expo? With over 90 employers, post-graduate institutions and non-profit organizations in attendance, there's bound to be something at this event for you! The Expo is entering its 7th year and it is always a great success. This event provides students the chance to network with potential employers and get informed about what to expect from a future in various fields. It's important to look your best at this event so no ripped jeans or yoga pants! Dress to impress! Many new grads find full-time employment at this event so do not miss out! This event is NOT RESTRICTED to graduating students; it's always great to get ahead so come on out first, second and third years and get yourselves informed :)! Hopefully this event will help you figure out what your next steps are. If you have any questions before or after attending, feel free to stop by the Career Resource Centre located in the Learning Commons and any Career Assistant will be happy to assist you. To register for the event and to view the list of exhibitors visit the website here: www.tripbuilder.mobi/brockexpo2012.